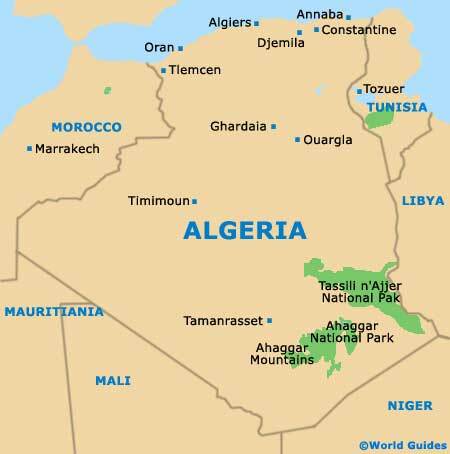 The People's Democratic Republic of Algeria lies in North Africa, where it is the biggest country fronting the Mediterranean Sea. Known as 'Al Jazair' in Arabic and 'Algérie' in French, Algeria is actually the second-largest country in the whole of Africa, after only Sudan. Although Algeria suffered badly at the hands of a serious Civil War in the early part of the nineties, the country is certainly beginning to turn itself around and is even now starting to encourage tourism in a small way. However, at present Algeria does rather remain a destination best suited to those with a lot of patience and confidence, favouring an unforgettable African adventure. 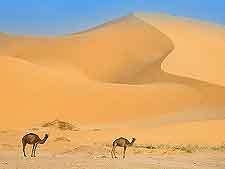 A vast area of Algeria is covered by the Sahara Desert, with the dramatic sand dunes of Grand Erg Oriental simply begging to be photographed. The Hoggar Mountains and their soaring peaks are another natural spectacle and are now listed as a UNESCO World Heritage Site. 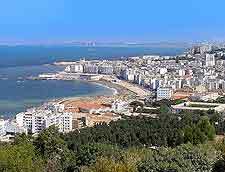 On the northern coast, Algiers serves as the capital city and is where most people first arrive. Several reputable tourist information outlets are located in Algiers, with the most popular being the Office National Algérien du Tourisme (ONAT) on the Rue Didouche Mourad, which is relatively close to the Cathedrale du Sacre-Couer, the Parc du Mont-Riant and also the University of Algiers. The beaches and coastal attractions are a major focus of attention in Algeria and tourists choose to holiday at not only Algiers, but also at the seaside resorts of Annaba, around Oran and along the aptly named Turquoise Coast. 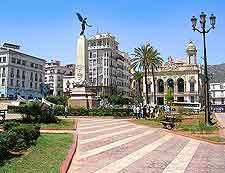 Being the capital of Algeria, Algiers is where many of the most appealing sights and sounds reside, such as the bayfront Notre Dame d'Afrique basilica, the Jardin d'Essai du Hamma botanical gardens and the family friendly Ben Aknoun Zoo. 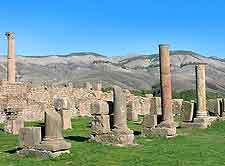 However, don't restrict yourself to staying in Algiers for the entire duration of your Algerian holiday, since the Roman military and amphitheatre remains at Tipaza are quite unmissable, as are the prehistoric cave paintings at the Tassili n'Ajjer mountain range, which are to be found on one side of the Sahara Desert. 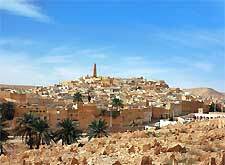 More information about Algeria Tourist Attractions. There are many mind-blowing landmarks spread around Algeria, with one of the most famous and photographed being the Monument des Martyrs (Makam Echahid) in Algiers, which remembers those who lost their lives during the Algerian War of Independence (1954 to 1962) against the French. Also in Algiers is a magnificent collection of Ottoman architecture within the Casbah district, the truly ancient Great Mosque (Jamaa el-Kebir), the 17th-century New Mosque (Jamaa el-Jedid), and the extremely famous Grande Poste building, which boasts a bright-white facade and resembles more of a palace than an actual working post office. Sightseers should also pencil in a trip to the Al Qal'a of Beni Hammad, where a small taster of 11th-century remains suggest the former glory and grandeur of Algeria's very first capital city. 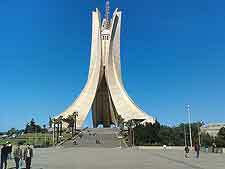 More information about Algeria Landmarks and Monuments. Algiers should be your first port of call if you are in need of a museum fix, or simply looking for information about the history of Algeria. Here you will find the highly regarded Bardo Museum of Prehistory and Ethnography (Musée du Bardo) and its vast array of fossils, prehistoric artefacts and old examples of pottery. Also in Algiers is the acclaimed Museum of Fine Arts (Musée des Beaux Arts), which is regarded to be amongst the best in North Africa and features an assortment of European and Algerian masterpieces. However, don't feel that you necessarily need to stay in Algiers for museums, since similar cultural attractions are available elsewhere, at destinations such as both Constantine and Oran. More information about Algeria Museums and Algeria Art Galleries. Outside of Algeria and close to the border are many wondrous world-class attractions, being located in the neighbouring countries of Mali, Mauritania, Morocco, Niger and Tunisia. Holiday makers looking for the ultimate North Africa experience really should leave enough time to venture next door into Morocco (west), where the vibrant oasis of Marrakech awaits, a city famous for its enormous outdoor market (souq), mosques, ramparts and palaces, such as both the Palais de la Bahia and the Palais El Badi. To the north-east of Algeria, the country of Tunisia is home to some sumptuous Mediterranean beaches and resorts, while tourists looking for a more unusual and remote break may even like to head into Libya and pay a visit to its capital city of Tripoli. More information about Algeria Attractions Nearby.